Home > Oral & Throat Cancers > Gum Cancer: How Common is It? 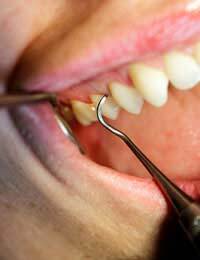 Gum cancer, which is also known medically as gingival cancer, doesn’t only affect the gums. It can also spread to the cheeks, tongue or soft palate at the roof of the mouth. It is a fairly common cancer in some parts of the world because of the association with tobacco and alcohol, but is generally a relatively rare cancer that accounts for only about 2% of all cancer deaths. Detecting gum cancer early is difficult as the symptoms are very similar to those of other common problems, such as mouth ulcers or tooth decay. Having a regular dental check up is a good idea, not only because this helps you keep your teeth healthy – a dentist is well aware of the early signs of gum cancer and if he or she spots anything unusual, you can be referred for further tests and early treatment if that becomes necessary. In the UK over 75% of people who develop gum cancer are smokers. The strong link between smoking and gum and mouth cancer is thought to occur because the delicate mucous membranes in the mouth are very susceptible to the hundreds of different carcinogens (cancer-causing chemicals) present in tobacco. Smoking increases risk, but chewing tobacco is even worse; cultures around the world that do this have very high rates of gum cancer. In India, where most men regularly chew tobaccos such as betel and paan, 40% of all cancers occur in the mouth. This compares with just 4% in the UK. Excessive and regular alcohol consumption can also be the cause of some mouth and gum cancers. In Australia, Germany and Brazil researchers are currently investigating whether some of the mouthwashes that have a high alcohol content could be related to a greater susceptibility to gum cancer. Apart from having a dentist check up on your general mouth health, you can also become more aware of the early signs of gum cancer. These can include having a sore throat that doesn’t go away after more than three weeks (this can also be a sign of other forms of mouth or throat cancer) or having any unusual white or red lumps on any parts of your gum. Experiencing unusual bleeding from the gums is another thing to look out for, as is having mouth, tongue or gum ulcers that won’t heal. Any difficulty swallowing or chewing food, pain in the tongue, or problems moving it properly should be reported straight away to your GP. Finally, pain in the jaw that continues once tooth decay and tooth problems like abscesses have been ruled out, should never be ignored. In some cases it may be necessary to remove sections of the tongue, palate or jaw and this will be followed by reconstructive surgery to rebuild the jaw or cheeks or other missing tissue. The best thing to do is to be sensible about lifestyle that might increase your chances of gum cancer. Avoiding tobacco and drinking alcohol within safe limits is sensible. Apart from that, having a regular dental check up is really all you need to do. Gum cancer is rare in people who don’t smoke, don’t chew tobacco and who don’t drink heavily.